Telescopes Beachfront infinity pool Surf Resort - West Sumatera, Mentawai Guests overall rating: ☆☆☆☆☆ 0 based on 0 reviews. Telescopes Beachfront Infinity Pool Surf Resort is a paradise of endless adventures located in the Mentawai Islands, West Sumatra, Indonesia. Amazing facilities and very interesting surf spots that will make your dream surfing experience come true, from beginners to pro surfers. Mentawai is known to have the best waves in the world, without a doubt you will witness it yourself! We will take you to the natural beauty of Mentawai. A swimming pool that directly faces the sea will make your swimming experience more enjoyable, plus outdoor activities: exploring the mangrove forest, and you can also visit the community settlement which is not far from the resort, where you can explore the street and feel the local community hospitality, explore the cultures, or foods. 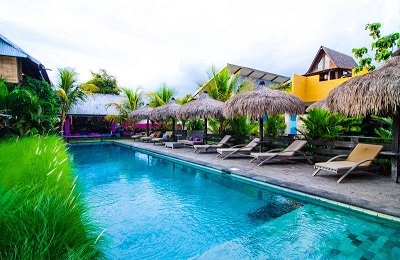 Telescopes Beachfront Infinity Pool Surf Resort will make your days unforgettable. 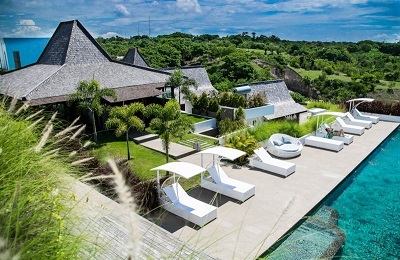 8 spots are lined up forming elegant and ethnic nuances of tropical settlements. Swimming pool with ocean view. Enjoy a freshwater bath with unbeatable views. Our pool has a shallow area ideal for children and all the details around to make it an experience. Classic design and elegance of our Restaurant & Bar that will accompany meal times, it feels like eating in a natural environment and of course make your meal even more enjoyable. Restaurants that directly face the sea, full-air is the most appropriate choice to relax after doing fun activities. Food specially cooked by our professional chefs is special for you. Various fresh food dishes that we can directly get from local catches will certainly make different flavors that will spoil your tongue. You can order anything that you want, and also we also open boundaries or special requests from our guests who are vegetarian, vegan or gluten-free, etc. All types of food are equipped with various vegetables, rice, fruit, all high quality and served wholeheartedly to our guest. Telescopes Beachfront infinity pool Surf Resort is strategically located, and from our resort, we can see more than 7 waves. Our amazing bay holds three breaks, but we also have a fleet of boats to move our guests to the best bet every single day. Waves are mostly in the two to six-foot range depending on the wave spot all year long . Between April and October, the islands receive constant swells. Shoulder season months generally have smaller swells but are also less crowded. World-class surfing points like Telescopes, Iceland, Scarecrows and other 10 surf spots are in 20-minute range boat area. One of the famous spots that you can easily get from the resort is Telescope, it takes less than 10 minutes to get there by our private speedboat. Its one of the best waves in Mentawai, friendly and perfect for turns or to try safe barrels. There are a lot of wave spot choices for surfers, from beginners to pro surfers. Only less than 5 minutes with our private speedboat you will arrive at your destination to learn your surfing skills according to the level you want. All you need is a pair of surf surfing shoes for coral reefs and a long-sleeved rash guard for protection. Laze lying in the sun can go straight to the private beach which is very close, you can also walk along the private beach and enjoy the beauty of the local nature. Telescopes Beachfront infinity pool Surf Resort is 10 minutes by boat from the famous Telescopes Surf Break, located only less than 10 minutes away from the main port of Mentawai on the small tropical island of Awera. This tropical island surrounded by luxurious coral clusters and also surrounded by white sand, turquoise water makes this island look attractive and comfortable to stay. The Island is well connected with the Sumatran mainland by regular ferry services. The best way to get to Padang is to fly from Jakarta with Garuda or Lion Air, or Kuala Lumpur with Air Asia. Book the TRANSFER PACKAGE and let us take care of everything for you. This includes all transfers from Padang airport to your hotel and to the harbor the following morning, 15 kg luggage allowance, and porters. Organize your own transfer to Tua Pejat (capital port of the Mentawais) where you will be greeted by our staff and transferred by our speedboat. It takes less than 10 minutes by our private speedboat. BETTER TO KNOW BEFORE YOU GO! Please note: All guests must arrive in Padang at night before Mentawai Fast ferry departure due to the early morning schedule. 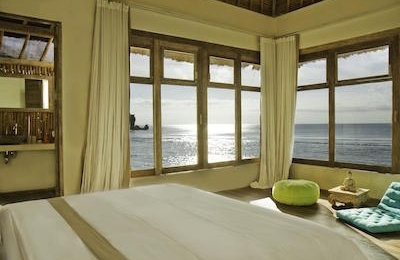 On return, depending on flight times, most guests require an overnight stay in Padang. The Mentawai Fast ferry departs from Mentawais, every Monday, Wednesday, Friday and Sunday at 3:00 PM and arrives in Padang at approximately 6:15 PM. -Arrive in Padang (anytime on Sunday, Tuesday or Thursday) and meet our crew at the airport. -Transfer from airport to your hotel. -Transfer from your hotel to the harbour at 05:30 or 06:30 AM. -Meet our crew and transfer via speedboat to the Resort (Less then 10 minutes). -Depart via speedboat from the Resort at 2:00 pm (Monday, Wednesday or Friday). -Meet our crew and transfer from the harbour to your hotel. -Transfer from your hotel to the airport. Travel documents: To entry Indonesia, it requires a passport valid for at least 6 months from the date of arrival. Insurance / Evacuation: For your personal safety, travel insurance with medical evacuation coverage is mandatory. In case of an emergency, we will assist you in contacting your insurance company. Surf Boards: Indonesia customs allow a maximum of 3 surfboards for personal use. Additional boards will be considered imports and will be charged a fee (approx. 100 USD per board). Mentawai Surf Tax: Surfers must pay a surfing tax of 1,000,000 IDR (approx. 80 USD) per 15 day stay. This tax is to be paid to the tourism office in Tua Pejat/Mentawai on your arrival. Internet: Free WiFi is provided. However, due to our remote location, the signal can be temperamental. For those needing a reliable connection, we suggest buying an Indonesian Telkomsel SIM card in Padang (approx. 150,000 IDR / 10 USD with 2 GB of data). Please make sure the vendor activates the card. Payments: The local currency in Indonesia is Rupiah (IDR). Cash withdrawals can be made at ATMs in Padang. You can also bring foreign currency to exchange in Padang. We accept cash (only IDR), VISA and MasterCard. Unfortunately, we do not accept American Express. Porters: At the harbour, there is no way to load/unload your bags without the help of porters. Price depends on number of bags and boards. If you choose any of our TRANSFER PACKAGES, porters are included. Bargaining with porters can be unpleasant, therefore we recommend choosing one of our packages to avoid possible misunderstandings. Mosquitoes / Malaria: Mosquito bites can bring several diseases, so personal precautions are suggested. Risk of contracting malaria is extremely low in the Mentawai Islands. * 10 or 11 nights stay prices are including one night for free. * Minimum 5 nights stay. * Surfing on both arrival and departure days. Transport by speedboat from the “Mentawai Fast Ferry” stop in Tua Pejat to our Resort. This transport takes about 10 minutes. Transport from our resort to the “Mentawai Fast Ferry” in Tua Pejat. Accommodation in our comfortable villa with A/C. Three main meals a day (breakfast, lunch and dinner). Snacks at any moment of the day. Non-alcoholic drinks such as sprite, coca cola, Fanta, water, fresh homemade juices. All trips on our boats to the different surf spots (surfer). Use of our chill out and games areas. Use of our snorkelling and stand up paddling equipment. Wi-Fi connection in the central building. Personal accident insurance (this is required). Mentawai government surfing tax 80 USD. Airport transports, transport to ferry, ferry tickets and accommodation in Padang (comfort package).